HashBrowns…August 27-30 2012 Imaginary Friends Forever? With the coming of summer’s end, I find myself pondering on other things in my world that are also fading. My littlest has grown one year older and is not so little anymore. I have one of my very first smalls leaving in the middle of September, which is tougher than you might think to deal up. She may not be mine, but she is…you know? And now my middle son is having a birthday…my little Bird is going to be 11. When he has a birthday, so does his little friend named Hi. Hi is a jaguar. He has lived with the Bird and been part of our family since they were both brand new. Hi has been lost several times. He has had “surgery” to put his head back on more than once! Gramma has sewn little coats for Hi when his fur was rubbed right off. Hi has even survived a fire, thanks to his big sister Liz. If there ever was a stuffed toy that has had the nursery magic worked on him…it’s Hi. He is Real. I find myself worried that whispered conversations between the Bird and Hi are going to be less and less. That as Birdie enters middle school, his little friend will find himself sitting on the shelf more and more often. I don’t know who I am more upset for…Birdie or Hi? With childhood comes such wonder, such tenderness, and a capacity to love unconditionally. My wish for my Birdie as he grows, is that he will keep these precious qualities of childhood, and always have a tender place in his heart for Hi… that he will always hear his little jaguar’s voice answer back. 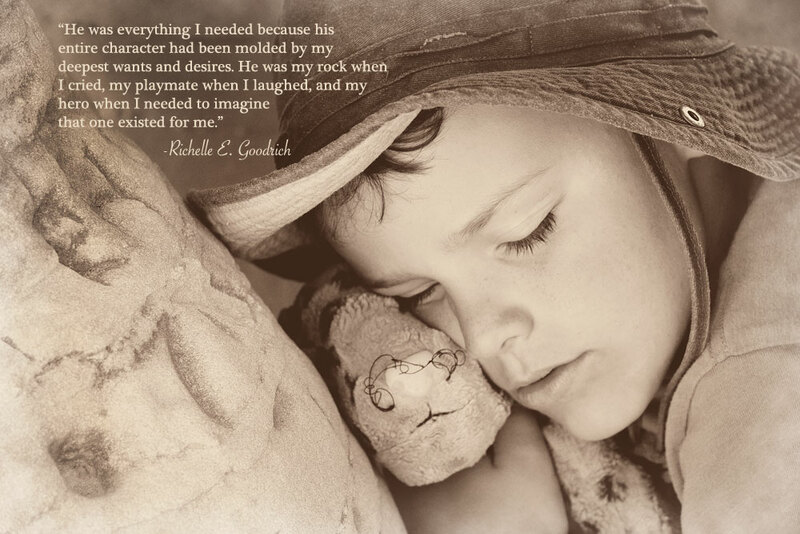 Does the little one in your life have a special stuffed or imaginary friend? I would SO love to hear about it! Please share your comments or stories below…it always helps to hear from other parents in all corners of the earth who are having the same kinds of experiences. Don’t you think? I, personally, have had an imaginary friend for my entire life…I even STILL find myself talking to him when I’m under severe stress! His name is James Oliver Buckley. He’s a little English boy who had to go the Scotland to live with his grandfather! He had a dog named Scamper. I celebrated with him when he got a pair of “long pants” for his birthday (keep in mind, I was a 5 year old AMERICAN, at this point). Pretty involved, huh? You have NO idea! He never went anywhere with us, he basically lived at our house. I asked him why he didn’t go places with us like normal imaginary friends, he said “That is simply ridiculous! When you are out, you are with your family…you do not need me hanging about!”. Please note, James did NOT use contractions! I always liked that about him, it was classy! I would love to teach my daughter to not use them but it probably won’t work. A few years ago, when we lost our first daughter, James was there. I thought it was really strange! When I got pregnant again, I asked him why he wasn’t hanging about THIS time and he said I did not need him. I asked a friend of mine (a “sensitive”…who HATES the word psychic because it denotes frauds!) about him after that. He said that, all these years, my “imaginary” friend was…a spirit!!! That actually explained a LOT! Your sharing today touches me more than I had thought it might. Drawn in by your photo. I have not had one in my world be attached to an imaginary friendand maybe that was because all too often I encouraged my children to behave in a manner appropriate (or what I thought deemed appropriate) to the outside world. My heart aches at times to think I may have stolen a precious piece of childhood from my own children in my expectations. My kids have all grown now (my own ‘baby’ is 17 years) and are gearing up for the next stage in their lives. Now I am able to enjoy those childhood experiences through my two grandchildren… well, three actually because Patches also is real. He is my granddaughter, Ella’s, very best friend. Patches is with her where ever she may go and a prominent family member in all the family photographs. He has been lost in Quebec and happily recovered by some awesome MP’s, he has been bathed in the washing machine while Ella waits and watches. To this sweet girl he is real and I am getting the lesson and experience that what others may see or think it not at all important. Soon she will be starting Kindergarten and Patches will be waiting for her to come home and share all the cool things about school. I am grateful to be witness to the vivid imagination and incredibly deep and unconditional love of a little girl and her imaginary friend!! Ahhh…Patches. I have seen that beloved bear in some photographs. It warms my heart every time. Isn’t it delightful when life finds a way to give us experiences we missed out on in earlier years? Thank you so much for your insight here, Michelle xo Give those grandkids a snug this weekend and say hi to Patches for me! My daughter Brogan has Blankey, her blanket she received as a baby gift. She is also 11 and still sleeps with ‘him’ every night. It is, or was, one of those fuzzy flannel blankets with the satin edge all the way around the outside. Gramma has had to completely patch the entire thing as it started to disintegrate over time. It has an embroidery of Pooh and Piglet on it that Gramma has managed to salvage but it is in need of repair once again. The satin edging is still there, although torn and frayed. My baby used to be a thumb sucker and she’d get a hold of that satin edging in her fist and then that thumb would go in her mouth. We thought we’d lost Blankey once, on a holiday, when it was left in the bed and gathered up with the sheets and thrown in the laundry by the housekeeping staff. We called down to the front desk when we returned that night to see if they had found it, and low and behold, they had!! What a huge relief!! Although, Brogan was quite upset that he smelled different and didn’t smell like Blankey any more. I still have to sneak in a wash once in awhile, which she hates because then he smells different, he doesn’t smell like Blankey any more. I can’t imagine what it would be like if we lost Blankey, it would almost be like losing a member of the family. Blankey has tagged along with us everywhere we’ve been and Brogan says she is going to sleep with him forever!! Awww…Jackie…that’s awesome! Abby has a blankey with pooh bear on it, too!! She calls it PoohBear! Glad to hear Brogan hasn’t given it up yet! I can’t imagine Abby without PoohBear! That’s funny that she still doesn’t want you to wash it! Sweetness 🙂 Thanks for sharing, mama! My daughter is 8 years old. She has a stuffed dog named Freddie. Over the years Freddie has switched genders depending on Siera’s mood (and what she feels like dressing Freddie in), but he has always been there. In June she went to a sleepover and had to take Freddie. We had to stop at the doctor’s first, and she left her backpack (with Freddie in it) in the waiting room. We didn’t have the gas to go back, and the next day she flew to her grandparents’ house for the summer. When she got back home she was heartbroken when we realized I had forgotten to go back and get Freddie. I called the doctor’s, but I warned her that Freddie probably wasn’t there anymore. Miraculously, the office staff had kept Freddie this entire time (almost three months)! When we picked him up her face just lit up she was so happy to have Freddie back! YAY FREDDIE!! Glad he made it back to his girl! What a great story…thank you for sharing!! Adelaide (9 in a few weeks-eek!) has Bunny-B, or Bunny for short. She was gifted half a dozen bunnies as a baby and latched onto this one in particular, and it’s not the most washable or even the cutest (to an outsider). Bunny is worn through in many spots, his arms are barely hanging, he has a green checked ribbon around his neck and his nose is worn where she gives him “eskimo kisses”. Bunny used to accompany us on our walks. One day when she was 2ish we packed up and walked to Walmart and a few other stores in that strip mall in Okotoks. When we got home bunny was no longer in the stroller. I frantically phoned all the stores we had been to and no one had seen him. She was crushed. A few days later we were on a walk and found him on a totally different street than we had walked before. He was soaking wet, completely filthy. It was a miracle. I washed him and he was good as new. We made up a story about the riotous adventures Bunny had been on, drunken with carrot juice, staggering around town, hitting bottom before he came home; our own prodical son. Ever since bunny has always waited at home for us. I had a green glowworm when I was little, who was my very first kiss. These toys really are magical. I encouraged but neither of my other kids got attached to a stuffy the way Adelaide has. I wonder what makes some kids need that and not others. Thanks for sharing Arlee! All of my children, save one, has had at least one imaginary friend, and they have all served different purposes. My oldest (now 20 and getting married), had numerous imaginary friends that came and went to serve a purpose. When she got mad at them, she would crumple them up and throw them in the garbage. She played with them when she needed a playmate. They eventually gave way to books, and she would immerse herself in imagination of a different sort. Liam had the most consistent and truest (long lived) imaginary friend, Freddy Wilson. Freddy was all the things Liam struggled with – he was quiet, and shy. Freddy was louder, and more outgoing. Freddy kind of morphed into an alter ego for Liam, and when he was around 11-12, Liam would “become” Freddy when he felt like being silly and goofing off, and wasn’t sure if it was OK. And then, Freddy kind of melted away, but all the things that Liam had admired in his imaginary friend became part of who he is. He’s still quiet and thoughtful, but he has a great sense of fun and humor. Now Freddy is relegated to a pseudonym for practical jokes. Bridget (my Birdie!) had an imaginary hamster that would go with her when she felt scared. He came into being around the time she was being toilet trained, and he would sit on the counter and watch her. Again, as she grew older, the hamster had served it purpose.and was gone. Emma didn’t have an imaginary friend, and I attribute this to the fact that she had three older siblings who kept her entertained and amused all.the.time. And then we come to Jacob, who not only has one imaginary friend, but a whole imaginary world where he has created stories, and backgrounds and personality traits for at least a dozen friends. He understands that they are imaginary, but he has great fun with them. Piggy was the first. He was, of course, a pig who drove a motorcycle. One time I found a little acrylic clear stone with a flying pig in it, and gave it to him. I told him it reminded me of Piggy. He looked at it for a long time, then said ” I didn’t know Piggy could fly. That’s cool” Piggy has two sisters, Coconut, and a baby that has yet to be named. I could write a whole paragraph or two on PIggy’s family, but you get the picture. When we attend a funeral, someone in his imaginary world dies, and we talk about it. When someone’s getting married, someone in his world is getting married. I used to worry that he was living in this imaginary world, but I’m pretty sure he just visits it for entertainment, friendship, and to “sort things out” that are happening in his real world life. Experience has also taught me that this is a phase, and not one that I feel a need to rush him through! Now, I must say that i myself never had an imaginary friend, and couldn’t understand the desire for imaginary friends, or a blanket, or what have you. However, I now see how these things benefit and help a child deal with whatever their need is. When they outgrow this phase it’s a little sad to be sure, but exciting to see where they will go next! My older three all had blankets that they still have in their teens with varying amounts of attachment. My 4 year old however has Dolly. Dolly became a real gal several years ago. Dolly’s clothes go through the wash but Dolly herself isn’t submersible. The curls in her hair won’t stand up to water and are what my daughter loves the most, continuously stroking them when worried, sick or even excited. She is now in dire need of a hair transplant. Maybe from one of her “sisters” that we tried unsuccessfully switch with. Dolly has only been lost once and I have never experienced such a terrible feeling. I am sure many people are mortified that we let our child have such a thing but we love her. My little guy (age 5) has a friend Tigey (tie-gee) that is his best little bud at home. He had never had one until this summer, when we started staying at home and he had much less time playing with kiddos his own age. He has had stuffed animals since he was a toddler, but he only just really started interacting with them and talking about them like they were real this summer, and Tigey is his best bud. He even made a club with his animals, where they play different sports against each other, and Tigey is always on his team, even in football which Tigey isn’t particularly good at, but that’s okay because they have fun!, as my little man said. 🙂 It is really precious, and I hope he keeps his buddies at home even now that he’s started a new adventure of Kindergarten. Thanks for a lovely post as always! Arlee, I´ve been reading your posts and talking about them to teachers I work with here in my city. ( I´m in Brasil) I have 4 children, a girl and 3 boys. My little girl is now a beauttifull woman of 18, living in São Paulo , where she studies. She left us las year and it was one of the most difficult times for me. I had to really work with God, and let Him be in charge of her safety and well being. I also had to tel myself over and over that the people in SP are good hard working people , not robbers and murderers! It is a strange feeling to watch that little thing, that used to play with magic wands and imaginary friends, and see her in charge of her life now, deciding her actions and choosing her path. We know that this is why we prepare them from very early, but it is a strange feeling , hard to get used to… but it is possible! I still have my 3 boys to see changed into good men, hope it gets easier with practice! God bless you, thank you for your posts !